When pizza delivery companies added a box for “special instruction” on their online delivery pages, they were probably expecting to get answers along the lines of “don’t ring the doorbell, it doesn’t work” or “come around to the backdoor, please“. However, the internet has, of course, taken a good thing– and made it a whole lot better. 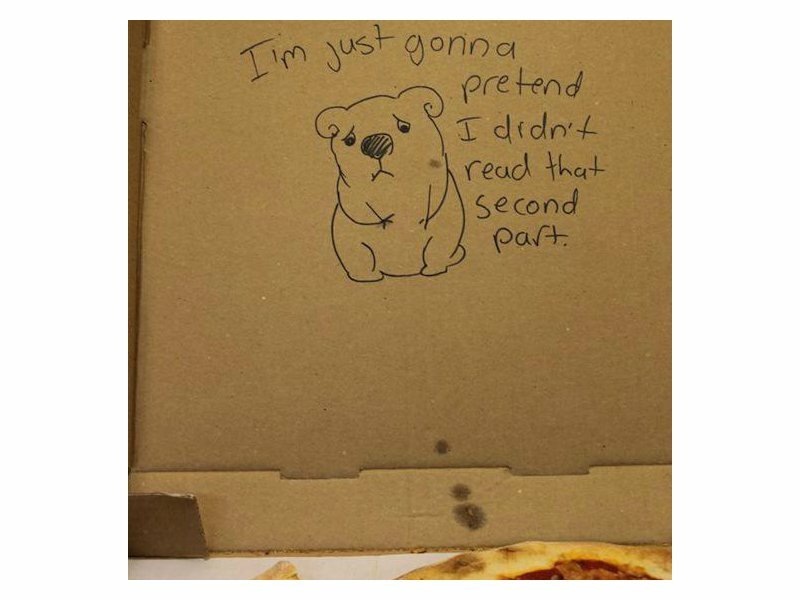 By putting funny “instructions” with their orders, some individuals have gotten amazing results from the most talented pizza makers ever. Here is a collection of some of the best. 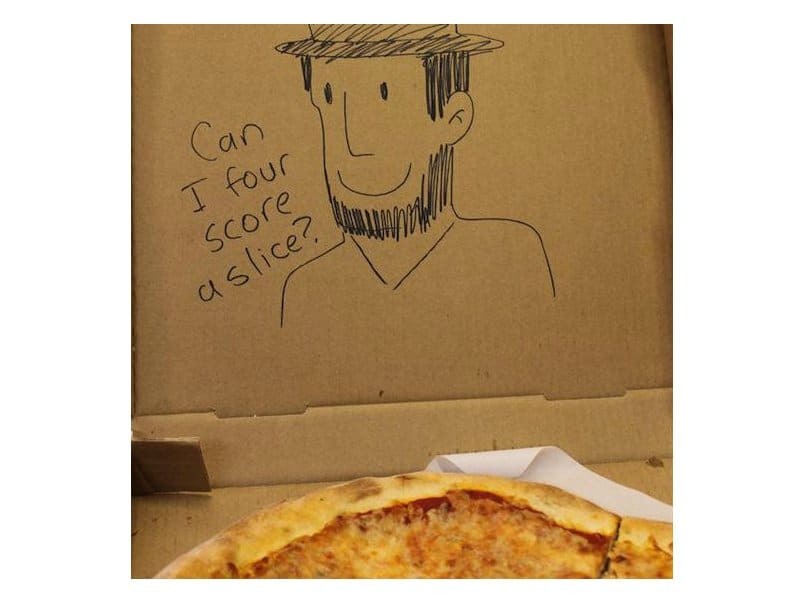 Not only did this pizza employee deliver on the Abe, but he or she took it a whole other step forward by adding some very punny text. It’s okay, Pizza Hut. 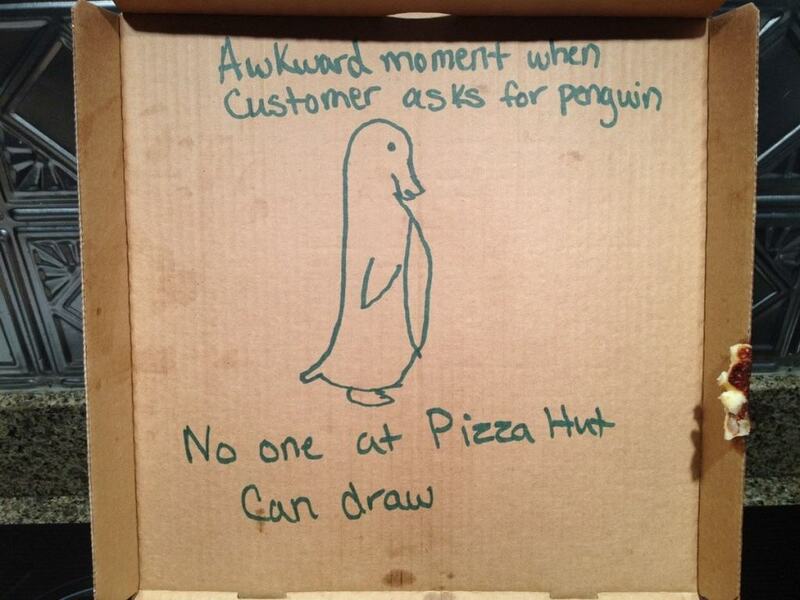 Your employees’ lack of talent made this pizza box even more hilarious, with the most awkward penguin the world has ever seen. 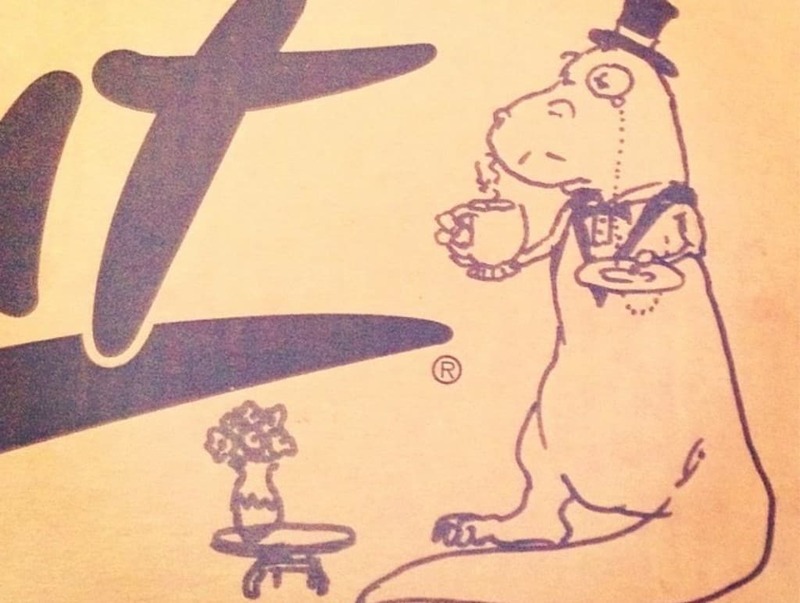 An imaginative request, and a wonderful delivery. 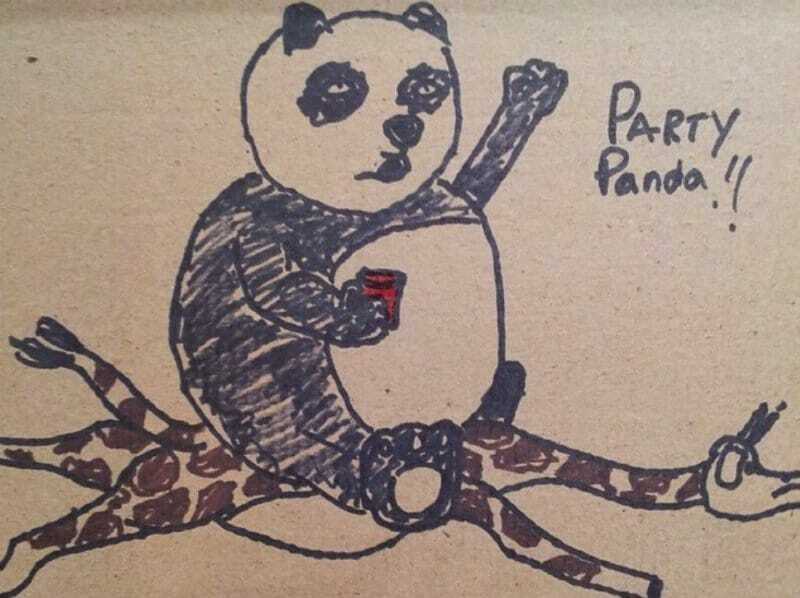 We wish we could party with a panda this cool. What a friendly looking guy, right? If he hadn’t already taken the liberty of grabbing a slice for himself, we’d be happy to share. This philosoraptor strikes again with… a very good question. 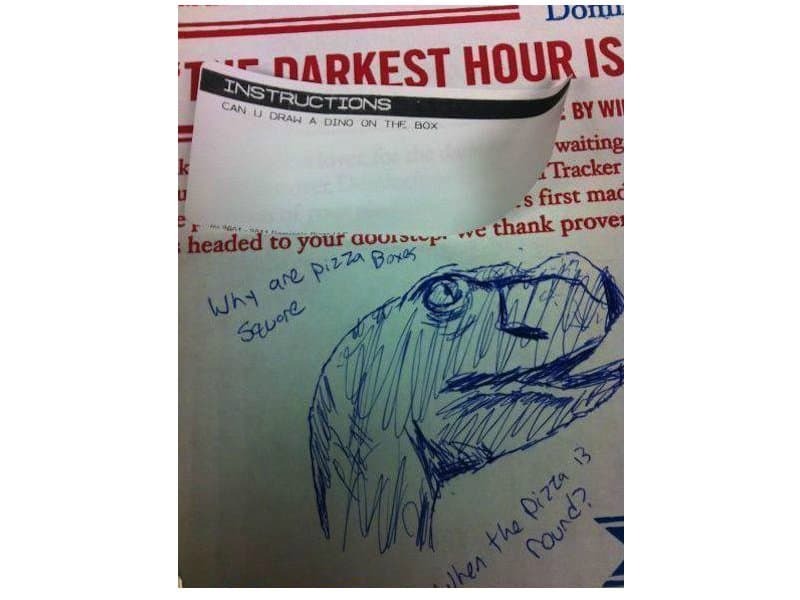 Obviously the drawer of this dinosaur is one of the most intellectual pizza deliverers out there. What a majestic portrait. This doesn’t belong inside a pizza box, it belongs on the wall of some esteemed art museum. Well, maybe not, but it still is a very amusing drawing. A fireball spitting dragon versus a sword weilding flamingo with the ability to balance perfectly on one leg. It’s surely the match of a lifetime, but we must say that our money is on the dragon. 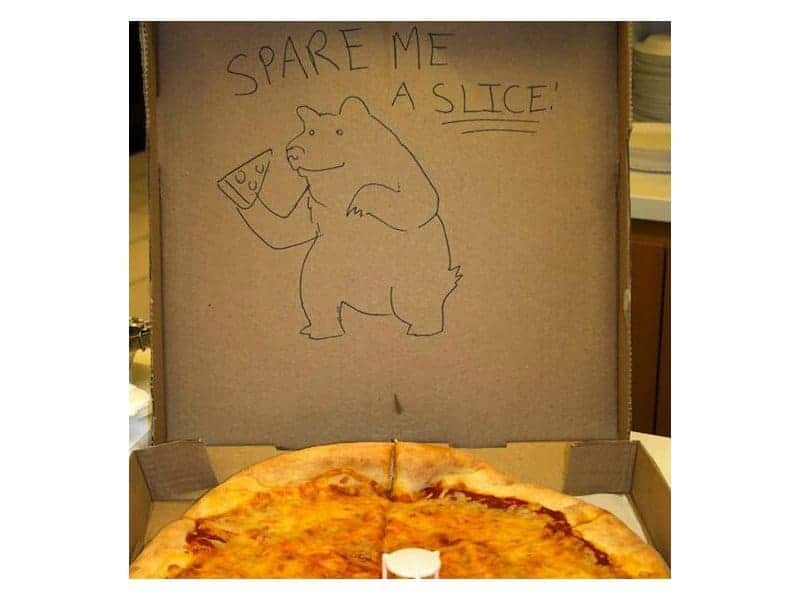 You think you’re clever, pizza guy or gal? Well, maybe you are. At least you drew a smiley face. Is that a giraffe? Is it a spotted, long-necked dog? And why is it floating in space that close to stars? 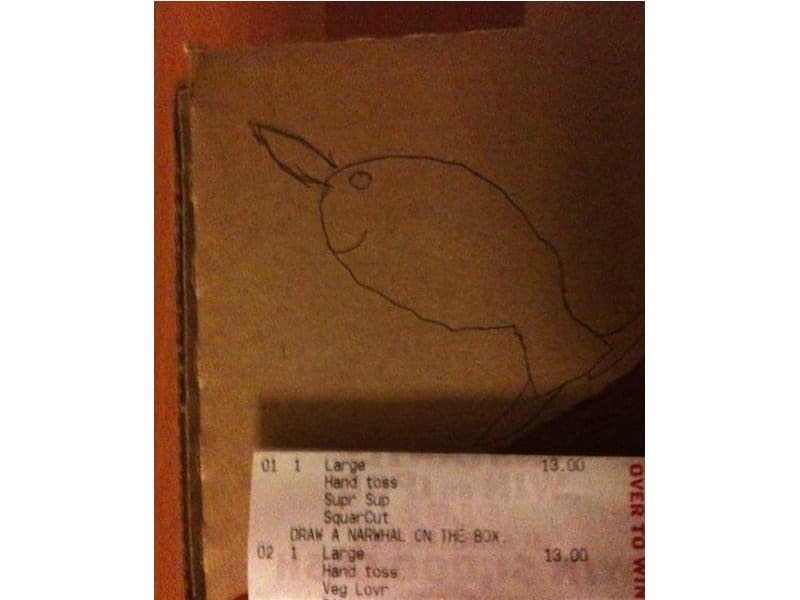 Throw in the creepy laughter, and we can’t help but wonder if this pizza deliverer was having maybe a little too much fun while drawing this. 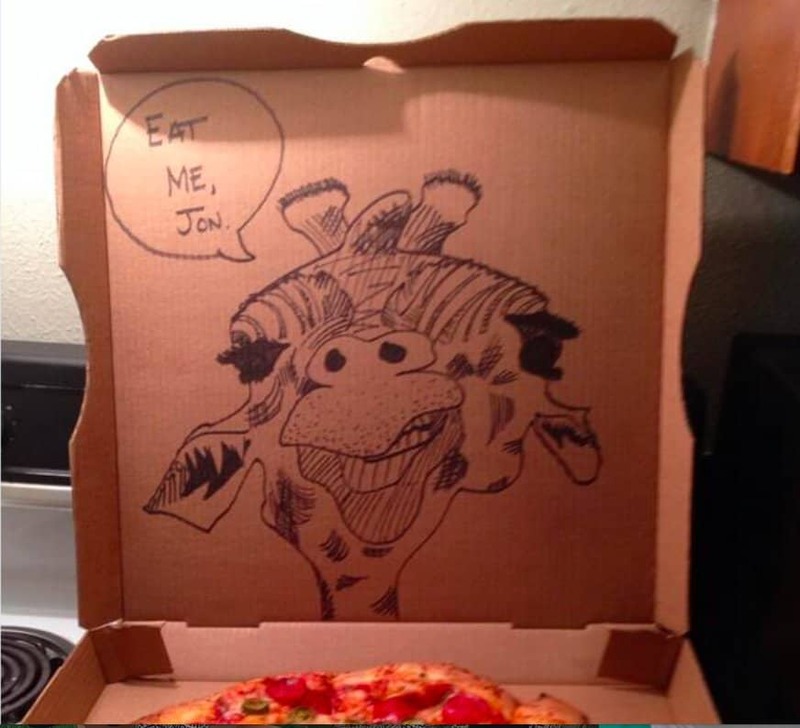 This shows a whole new side to pizza deliverers with a talent for drawing giraffes. 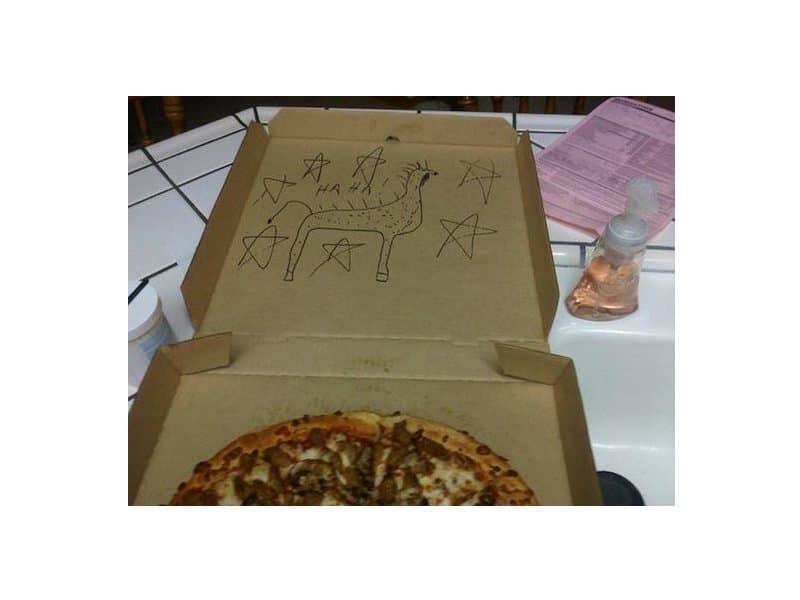 This sassy animal actually looks pretty amazing, and one can only assume that the pizza will be as artistically beautiful as the drawing. It’s funny because the pizza delivery person probably knocked on the door. 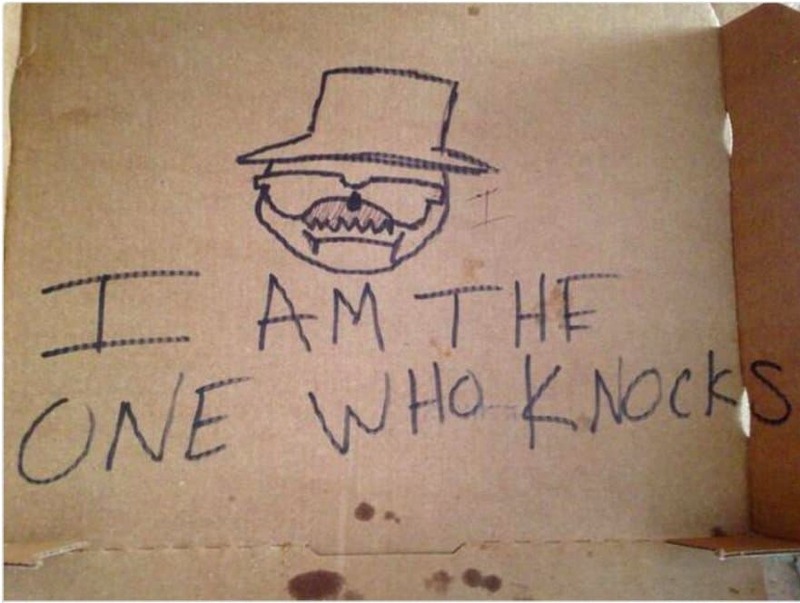 Does that make him or her Heisenberg? Also, was Heisenberg’s face really that squished together? 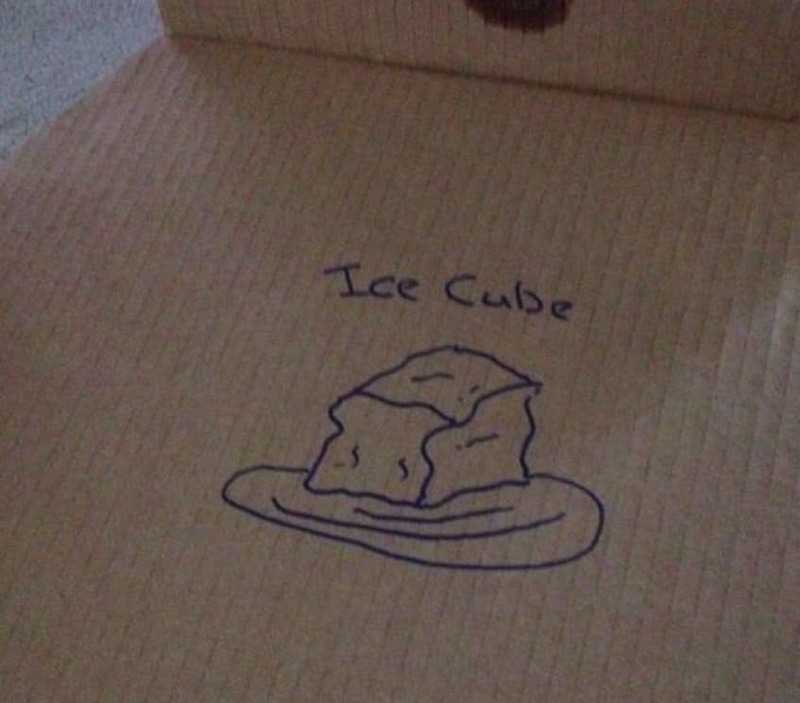 Although this ice cube looks more like an oddly shaped loaf of bread floating in water, we still give props for this witty response. 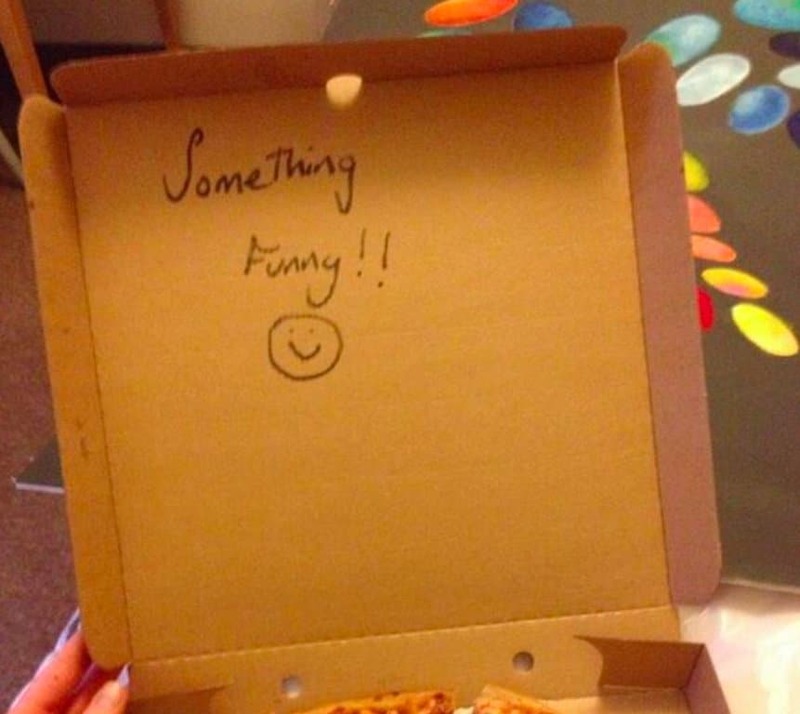 At least it was more clever than the “something funny” pizza box. 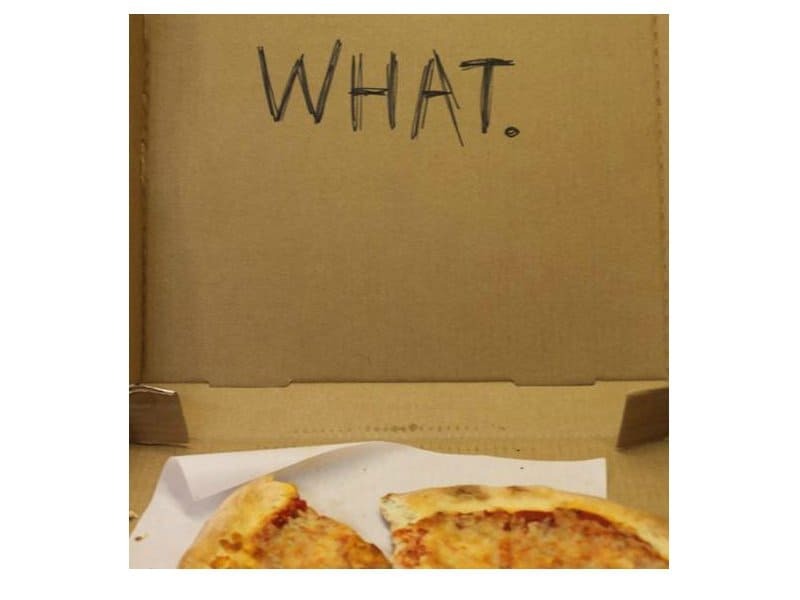 Was this pizza perhaps ordered from prison? We want to take that cute little koala right off the box and give him a hug. A prime example of a time of trying and failing. Though the effort is commendable, this looks more like a goldfish cracker with a really long nose than a Narwal. 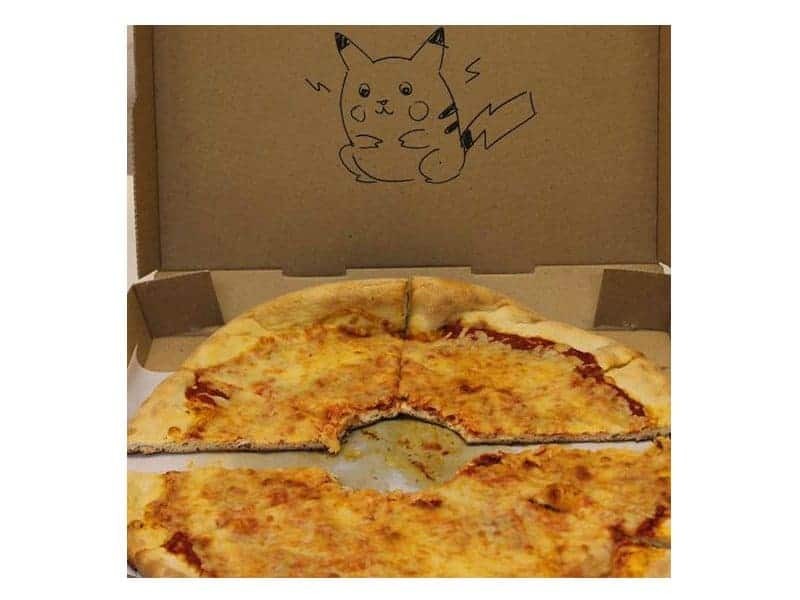 Not only did the pizza place deliver on the pokeball, but they threw in a bonus Pikachu drawing! Not only that, but the drawing is actually pretty good. 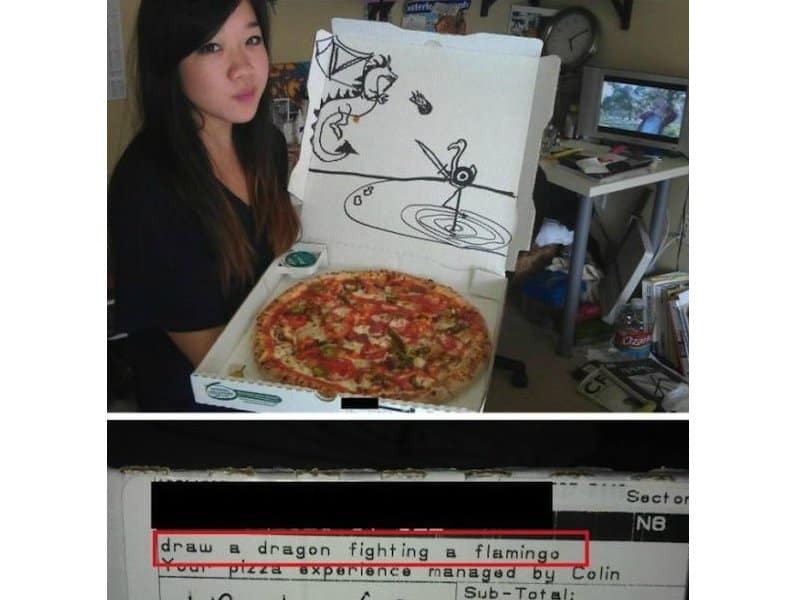 A+, pizza person. 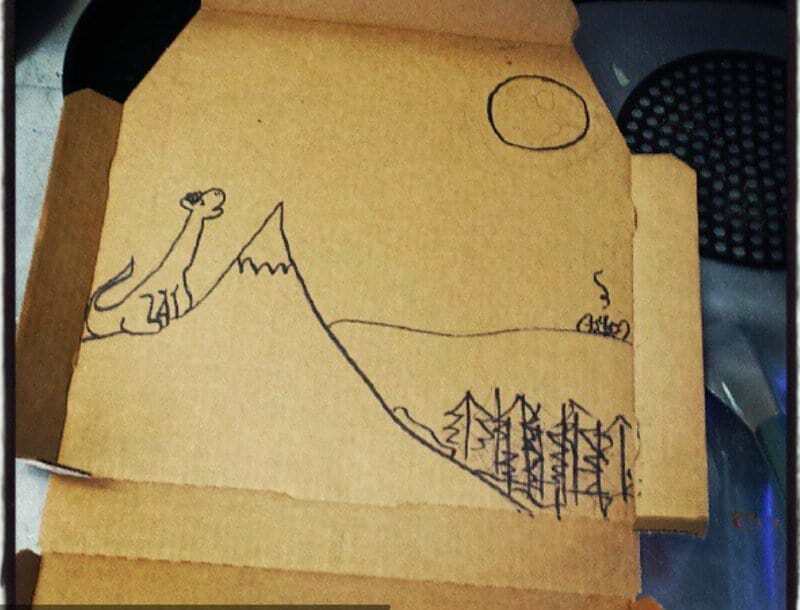 This is certainly one of the best pizza box drawings that has ever been documented on the Internet. The detail and skill-level shown is mind-blowing. Hopefully the artist was given a generous tip after this one. Sometimes the most vague prompts can result in the most beautiful works of art. This sassy South Park drawing deserves an award. Spock certainly did not hold back on the rudeness. 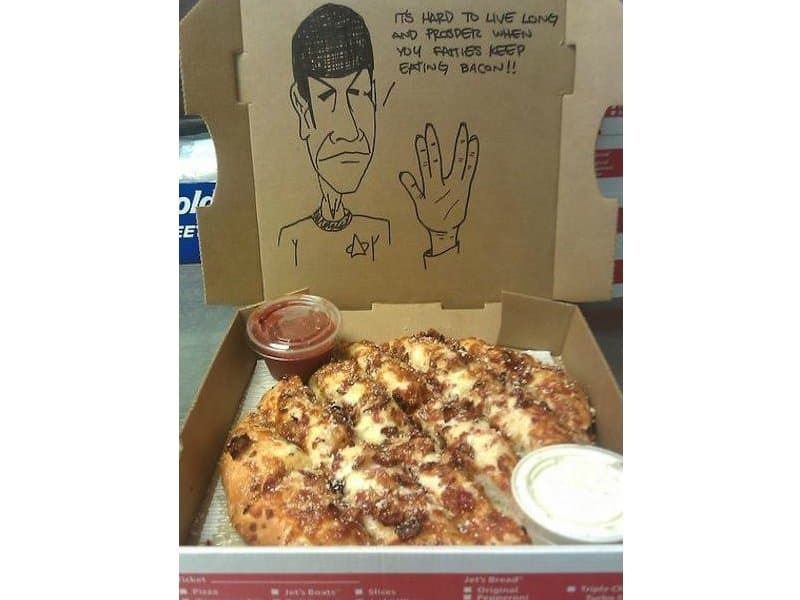 We would like to make it known that bacon pizza is delicious, no matter what certain Star Trek icons have to say about it. 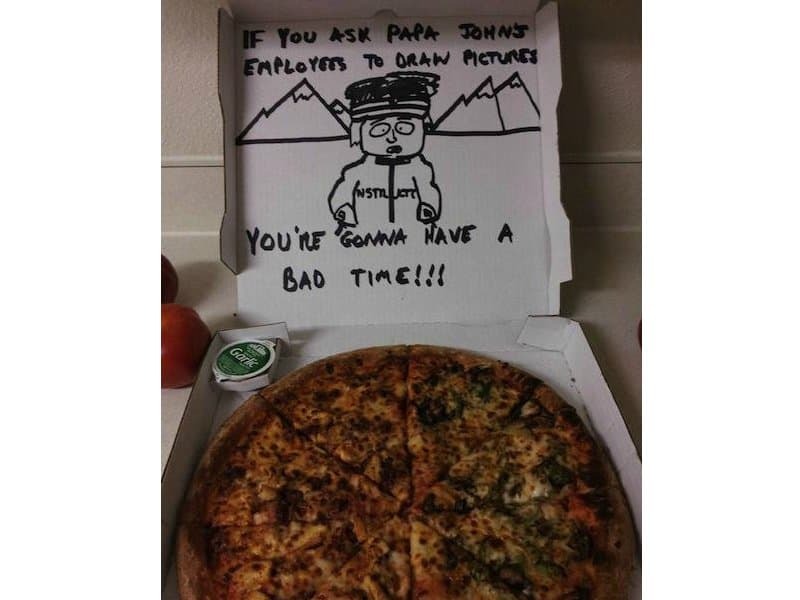 As impressive as an oil painting inside of a pizza box would have been, we have to side with the artists this time. WHAT? Or, should we say, WOT? 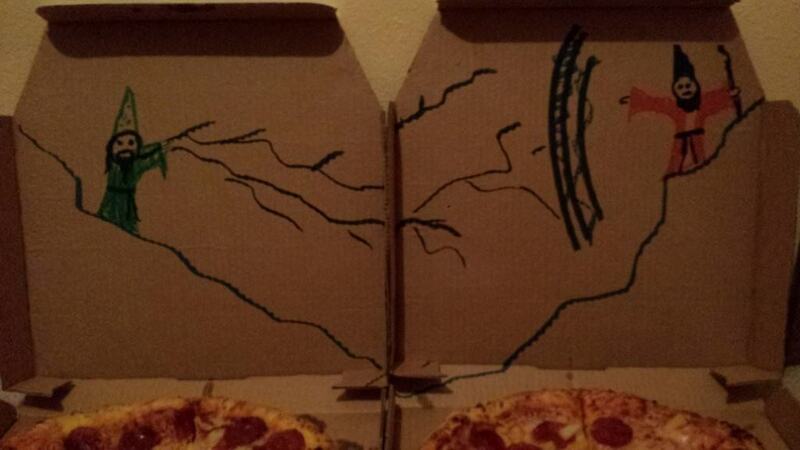 This epic two part battle is one of the most incredible pizza box fight scenes we’ve ever seen. Well, actually, it’s the only one we’ve ever seen, but that doesn’t take away from how awesome it is.